The global hydroponic vegetables market has witnessed impressive growth due to rise in the production of hydroponic vegetables. The growing awareness about the advantages of this form of cultivation over traditional farming has been propelling the global market. Hydroponics save water, land, use lesser fertilizers, and are a simple solution to problems of climate change. Owing to these advantages and more, the global hydroponics market is likely to be worth US$12,106.5 mn by the end of 2025 from US$ 6,934.6 mn in 2016. Analysts anticipate that the global market will register a CAGR of about 6.5% between 2017 and 2025. Consumption of diseased or contaminated plants can lead to E.coli and Salmonella poisoning etc. Increasing awareness regarding these risks is driving demand for crops and vegetables that are cultivated in a safe and controlled environment. Hydroponic plants are an ideal choice in this scenario as lack of soil in hydroponic systems eliminates the need for soil, which is where pathogens incubate. The above mentioned factors are responsible for hydroponic vegetables market to create significant growth and investment opportunities for players operating, especially in the Europe and North America region. Also, the brand owners are mainly emphasizing on market consolidation by mergers and acquisitions. Moreover, the increasing rate of urbanization in developed regions is expected to cause a major shift towards preference for hydroponic vegetables. By vegetable type, the global hydroponic vegetables market is segmented into cucumber, lettuce, spinach, peppers, tomatoes and others. Lettuce segment is estimated to account for over 32.9% of market proportion, in the overall global hydroponic vegetables market, in 2017. By distribution channel type, the global hydroponic vegetables market is segmented into modern trade such as a hypermarket or a supermarket), grocery stores, unorganized small stores, whole food and specialty stores, bulk suppliers and distributors and others. Modern trade segment is expected to dominate the global hydroponic vegetables market by the end of forecast period. By origin, the conventional segment is expected to continue its dominance in the hydroponic vegetables market over the forecast period. Natural & organic segment is expected to closely follow the conventional segment during the forecast period. Geographically, the global hydroponics market is segmented into North America, Europe, Latin America, Asia Pacific, and the Middle East and Africa. Of these, Europe is anticipated to dominate the global hydroponic vegetables market as the region is slated to account for 41% share in the overall market by the end of 2025. North America is expected to gain significant incremental opportunity in revenue terms by 2025 end. This trend is attributed to the mounting demand for variety of hydroponic vegetables in North America and Europe. Moreover, Asia-Pacific region is projected to exhibit significant CAGR in terms of value during the forecast period. Furthermore, Latin America and MEA are expected closely follow Asia-Pacific region in terms of CAGR of value over the forecast period. Key players in global hydroponic vegetables market include AMCO Produce Inc., Soave Enterprises LLC., Village Farms International, Inc., Thanet Earth Ltd., Eden Farms, Hollandia Produce, L.P., Bright Farms Inc., Emirates Hydroponics Farms, Platinum Produce Company and Millennium Pacific Greenhouses Ltd. This report provides forecast and analysis of the hydroponic market on global level. It provides historical data of 2016 along with estimated data of 2017, and forecast data up to 2025 in terms of revenue (US$ Mn). The report also includes macroeconomic indicators along with an outlook on hydroponic vegetables consumption pattern across the globe. It includes drivers and restraints of the global hydroponic vegetables market and their impact on each region during the forecast period. The report also comprises the study of current issues with end users and opportunities for hydroponic vegetables manufacturers. It also includes value chain analysis. In order to provide users of this report with comprehensive view of the market, we have included detailed competitiveness analysis and company players with their key developments and strategy overview. The dashboard provides detailed comparison of hydroponic vegetables manufacturers on parameters such as operating margin, total revenue, product portfolio, and what we call ‘innovation scale’. The study encompasses market attractiveness analysis by vegetable type, farming type, origin, distribution channel and region. By vegetable type, the global hydroponic vegetables market is segmented into cucumber, lettuce, spinach, peppers, tomatoes and others. By distribution channel type, the global hydroponic vegetables market is segmented into modern trade (hypermarket/supermarket), grocery stores, unorganized small stores, whole food and specialty stores, bulk suppliers and distributors and others. Modern trade segment is expected to dominate the global hydroponic vegetables market by the end of forecast period. By origin, the conventional segment is expected to continue its dominance in the market over the forecast period. Natural & organic segment is expected to closely follow the conventional segment during the forecast period. By farming type, the global hydroponic vegetables market is segmented into indoor farming and outdoor farming. Market numbers have been estimated based on data available from Food and Agricultural Organization (FAO) website, and extensive secondary and primary research, average pricing of hydroponic vegetables by vegetable type and the revenue is derived through regional pricing trends. Market size and forecast for each segment have been provided in the context of global and regional markets. The hydroponic vegetables market has been analyzed based on expected demand. Prices considered for the calculation of revenue are average regional prices obtained through primary quotes from numerous regional hydroponic vegetables manufacturers, suppliers, and distributors. All key end users have been considered and potential applications have been estimated on the basis of secondary sources and feedback from primary respondents. Country demand patterns have been considered while estimating the market for various end users of hydroponic vegetables and its related products in the different regions. Top-down approach has been used to estimate the hydroponic vegetables market by regions. Global market numbers by type, form and application have been derived using the bottom-up approach, which is cumulative of each country’s demand. Company-level market share has been derived on the basis of revenues reported by key manufacturers. The market has been forecast based on constant currency rates. The report provides detailed competitive and company profiles of key participants operating in the Global market. 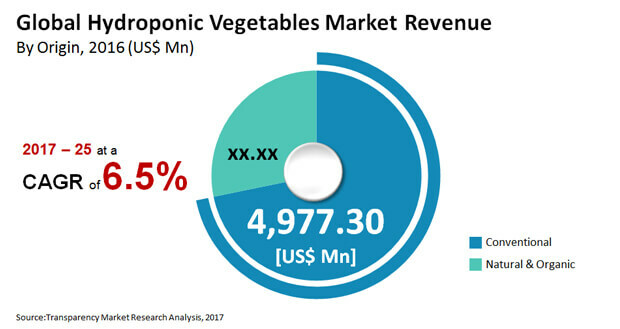 Key players in global hydroponic vegetables market include AMCO Produce Inc., Soave Enterprises LLC., Village Farms International, Inc., Thanet Earth Ltd., Eden Farms, Hollandia Produce, L.P., Bright Farms Inc., Emirates Hydroponics Farms, Platinum Produce Company and Millennium Pacific Greenhouses Ltd.